SUNDAY, SEptember 23rd, 2018 │THE ivy house│ 906 S. Barclay St. The 15th Annual Milwaukee Oyster Roast is one of the more unique events you'll attend in 2018. 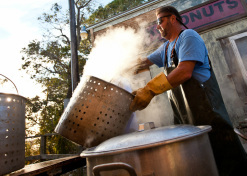 Popular in the "low country," oyster roasts involve copious amounts of freshly-steamed oysters, beer, music and fun, not necessarily in that order! It's so simple...we can't imagine why it took so long to get up to Milwaukee! This year we take the Roast outside! (Hopefully.) We are excited to be hosting this year's Roast at Milwaukee's newest event space: THE IVY HOUSE. Built with a modern, "green" aesthetic and room for both indoor and outdoor seating, we may have found the perfect venue! join us at the IVY HOUSE on Sunday, September 23rd, 2018. WE NEED SPONSORS! 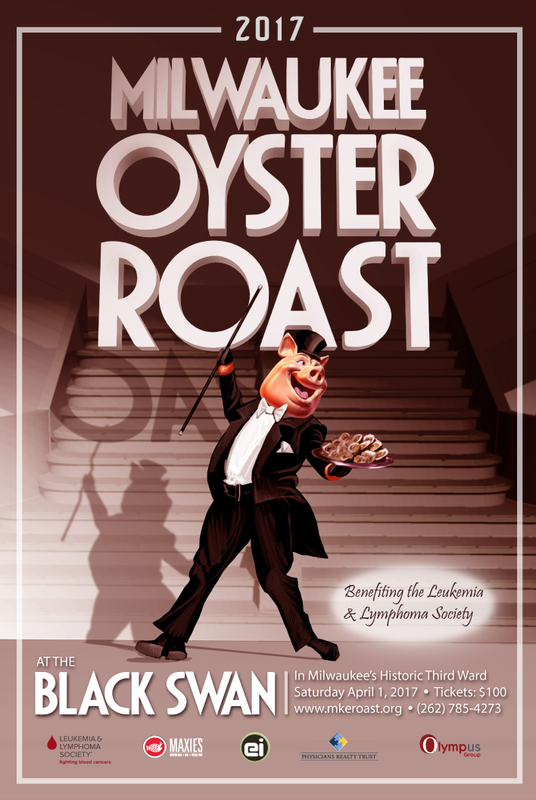 All proceeds from the Roast will benefit the Leukemia & Lymphoma Society! While we have partnered with a smattering of return sponsors, there is strength in numbers and we could use a little more help in order to bring you what is sure to be the most rockin' Oyster Roast ever! Help us help people with blood cancer and their families. 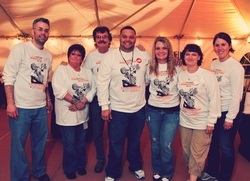 Our dedicated volunteers are the heart and soul of the Oyster Roast. Schlepping oysters, selling tickets, auction donations... there are many different ways you can participate and make a difference in the lives of those touched by blood cancer. 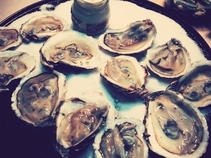 Stay up-to-date on all things Oyster Roast @mkeroast. Our tweets are fun & informative! Get updates, see Red Carpet photos, get a preview of the 2018 Milwaukee Oyster Roast. Check back often or better yet, sign up for email updates, so you can be the first to order tickets for the 2018 Milwaukee Oyster Roast! Tickets will sell out fast! Don't miss Milwaukee's most unique fundraiser! You can also check out our Facebook page and Twitter for daily updates and photos. The 2018 Fundraising Goal is $100,000! Why $100,000? $100,000 will allow our non-profit partners to provide financial support to individual families and organizations focused on cancer research, education or advocacy. And $100k can fund two Special Fellowships for one year, Special fellows are qualified investigators who have completed a minimum of two years post-doctoral research training and are continuing their research under the direction of a research Sponsor. The Special Fellowship should permit the scientist to transition to an independent research program. Feast your eyes on the 2018 Milwaukee Oyster Roast poster. The 2018 Roast Poster features our mascot "Jack" sneaking through the ivy to get his hooves on those coveted oysters! Click on the photo to the left to check out our very own Katie and Cory on the Morning Blend! Cory played a very cool acoustic version of "This Time Tomorrow."